frank buck1, originally uploaded by bucklesw1. 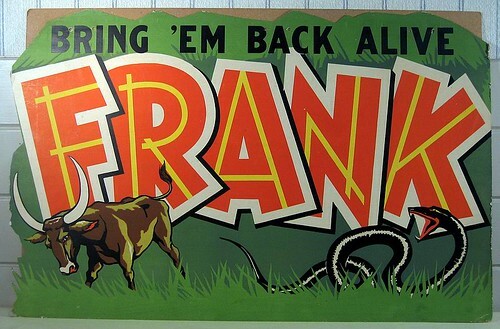 Here is a Frank Buck banner put out by RKO Pictures, it is in five parts, thought you might enjoy it. 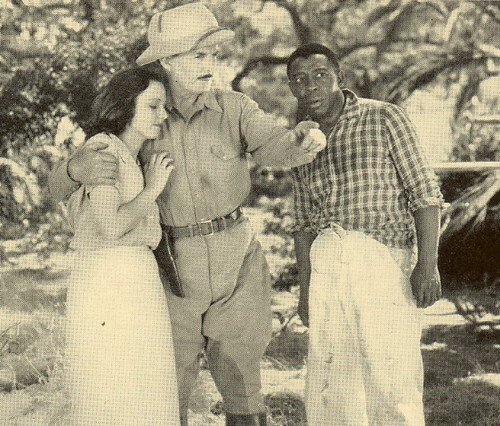 I also included a picture of Frank Buck & Zoe Dell taken in 1938.
frank buck2, originally uploaded by bucklesw1. frank buck3, originally uploaded by bucklesw1. frank buck4, originally uploaded by bucklesw1. frank buck5, originally uploaded by bucklesw1. frank buck& zoe dell 1938n, originally uploaded by bucklesw1. 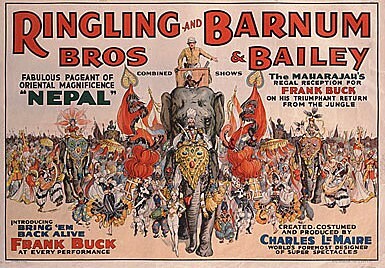 Ringling Barnum FRANK BUCK (1938), originally uploaded by bucklesw1. 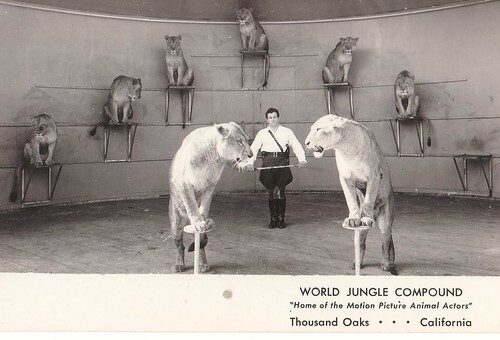 These lithos were created by Strobridge to promote Frank Buck's appearance (and the spec "Nepal") with Ringling Bros and Barnum & Bailey in 1938. 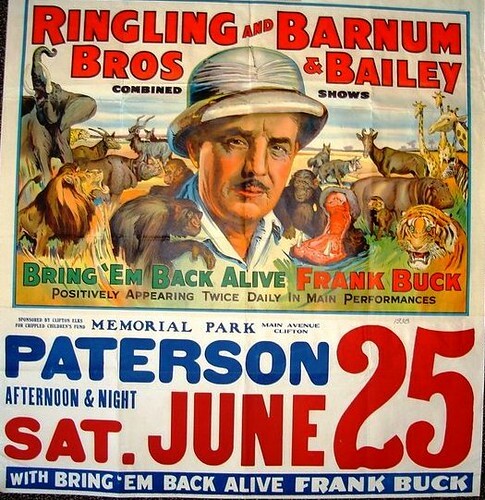 Incidentally, the poster with the Patterson, New Jersey date tag on June 25, 1938 were for shows that were never played, with the show having been shut down on June 22 by labor issues in Scranton, Pennsylvania. 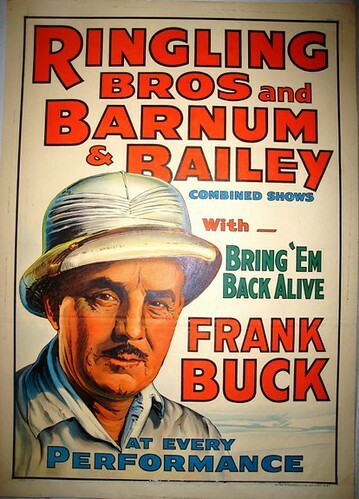 Frank Buck was also part of the "Ringling Bros and Barnum & Bailey Stupendous New Features" that joined Al G. Barnes and Sells-Floto in Redfield, South Dakota on July 11 - finishing out the season in Sarasota on November 27. 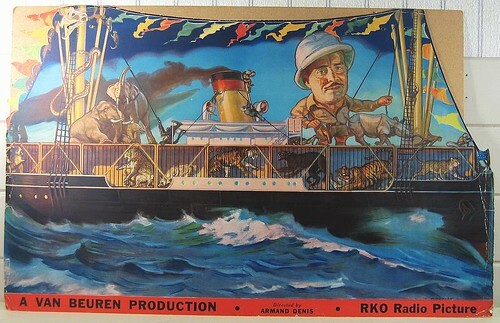 Ringling Barnum FRANK BUCK PORTRAIT (1938) Half Sheet up, originally uploaded by bucklesw1. 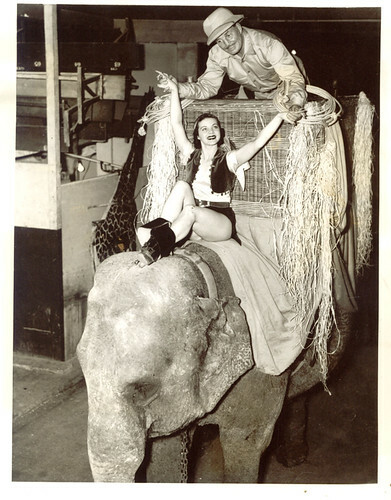 Ringling Barnum NEPAL (1938), originally uploaded by bucklesw1. Buck1, originally uploaded by bucklesw1. Buck2, originally uploaded by bucklesw1. 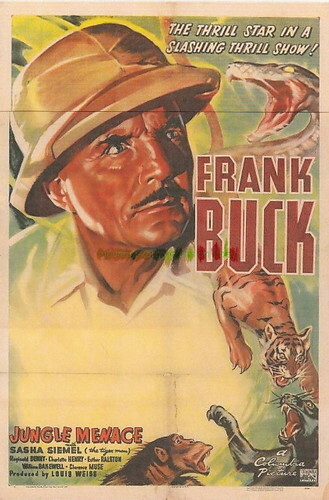 Captured by unfriendly natives (who have been made even more unfriendly by the presence of a ship load of escaped wild animals on their island) Frank Buck is told that he better recapture his “wild cargo” or else! Buck3, originally uploaded by bucklesw1. 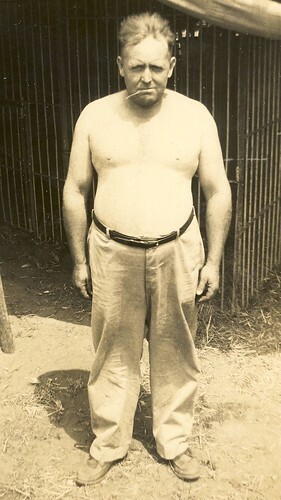 In addition to Frank Buck, JUNGLE MENACE boasted another real life hero in the cast: Sasha Siemel (1890-1970) who was known as “the tiger man” from having hunted jaguars in South America armed only with a spear. 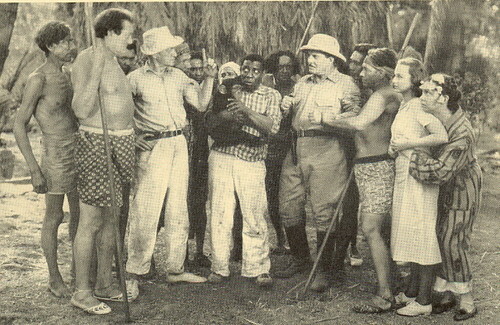 (He was also a famous South American guide and travelogue lecturer.) 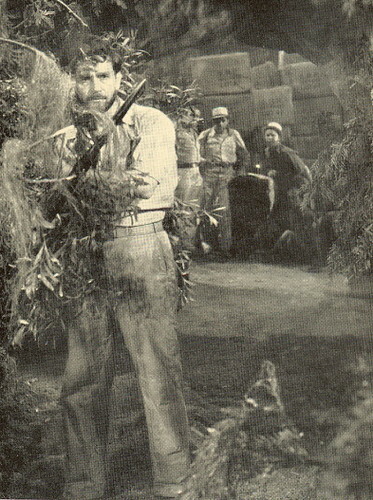 In the serial, Siemel plays a member of the river pirate gang. He later breaks with them and goes over to the side of law and order. 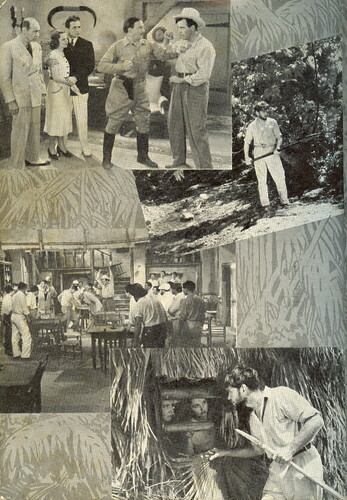 As was the case with Frank Buck, the scriptwriters chose not to use Siemel to full advantage. FrankBuck7, originally uploaded by bucklesw1. Buck4, originally uploaded by bucklesw1. 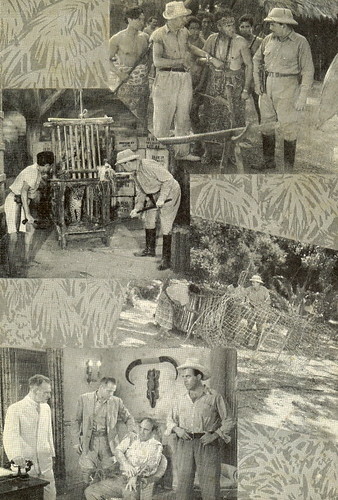 Two montages with scenes from JUNGLE MENACE. 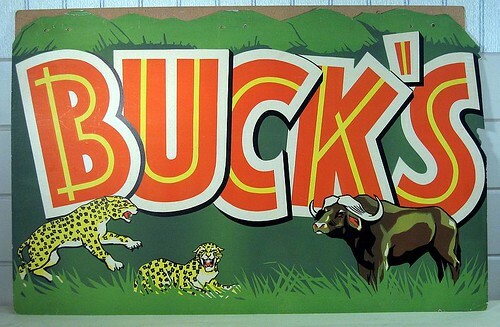 Buck5, originally uploaded by bucklesw1. Martin Lacey, Jr.19, originally uploaded by bucklesw1. 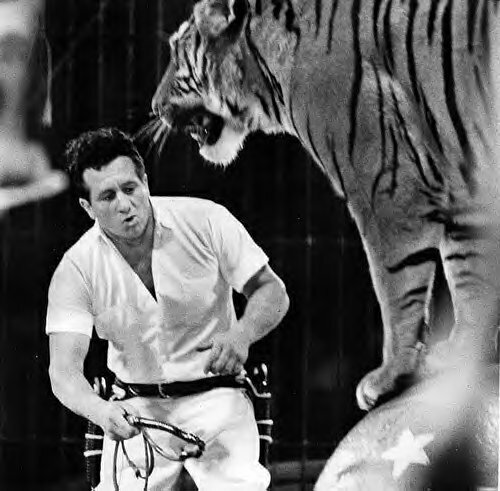 According to the Circus Fans Italia web site, wild animal trainer Martin Lacey, Jr. was slightly injured at the conclusion of his performance on Saturday night for Circus Krone, by a male lion named Kasanga. From what I read, I think it says that Martin Lacey was injured while feeding a piece of meat to Kasanga. Martin Lacey was taken to a nearby hospital for screening. Not sure what "screening" means. The attached pictures of Martin Lacey, Jr. with a large male l! ion (Kasanga?) accompanied the posting. 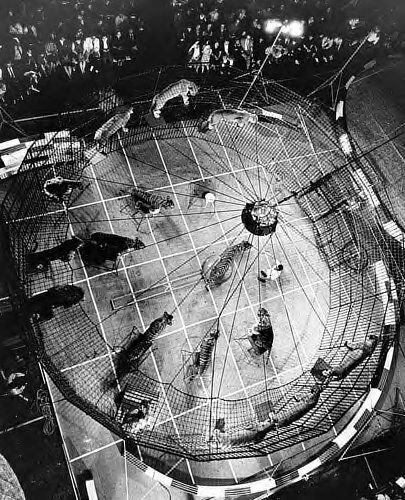 "LIGHT ACCIDENT TO MARTIN LACEY JR.
Christoph Enzinger us about a pair of articles appeared in the German press to which in the course of a show yesterday of the Krone Circus in Germany, Martin Lacey was wounded in the face by his male lion Kasanga in steps final number. 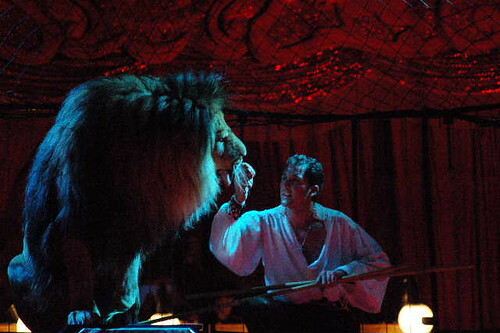 < br>While porgeva to the majestic lion a small piece of meat, was wounded in a cheek from a tooth of the great feline. 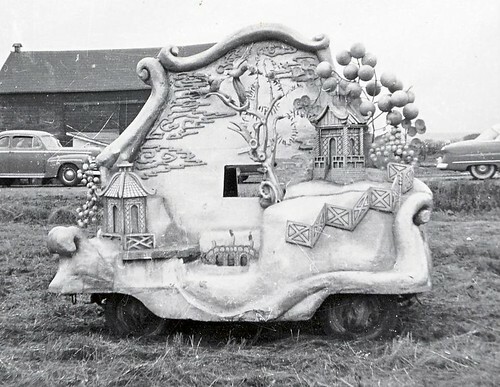 According to the press office of the circus the number would have been carried out regularly to term by the young English ammaestratore subsequently screened at the nearby hospital. Let us take this occasion in order to express to the great Martin, our estimated “King Lion” solidarity and closeness for what happened." These are links to the articles that were carried in the German Newspapers (they are in German). Maybe one of your Blog's European readers has more information, or a better translation. Martin Lacey, Jr.18, originally uploaded by bucklesw1. I feel the need to comment on the ridiculous “Kelly Miller Circus Animal Abuse” video now on YouTube. Not a single word of what this “reporter” claims to have seen during our setup in Greenville, PA is true. Not a word. Most of his misstatements are easily refuted by simple facts. 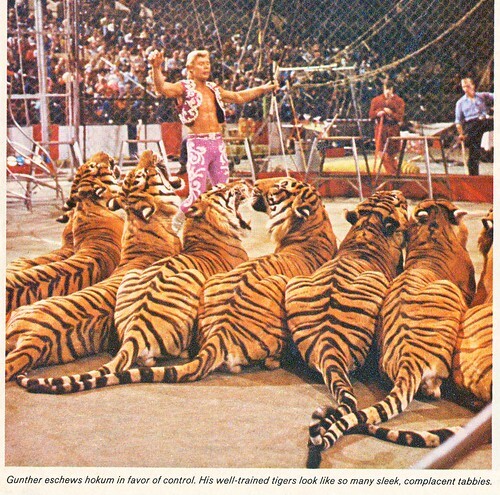 The reporter claims that animals are transported in unventilated trailers. 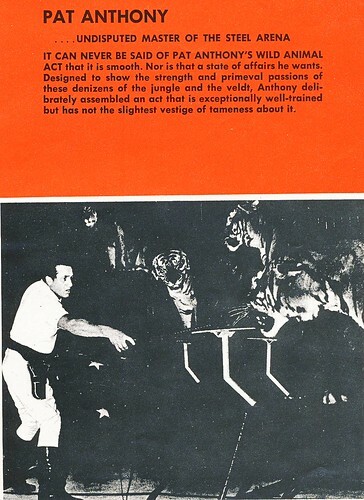 His own video clearly shows the many windows in the animal transports. He claims that the ride ponies stood for hours in their own feces. His video shows me moving a pony that was tied to the side of a truck for less than twenty minutes while a picket line was setup in a grassy field. He refers to our lot boss as “slave labor.” He calls Armando Loyal, the elephant manager a “smelly circus worker” In point of fact he threatened to “call immigration” after having worlds with Armando. 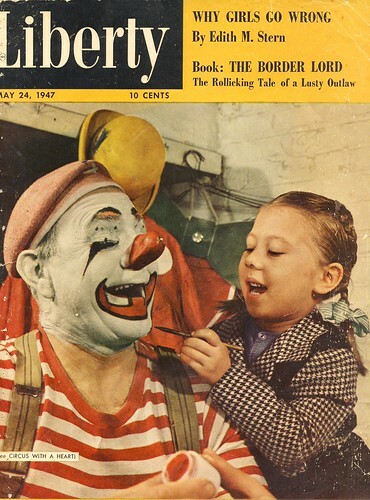 Then when Armando noted that he was born in Oklahoma he threatened violence. He states that all of our workers are “illegal aliens.” That the INS "confirmed" that. All of our guest workers have H-2B visas. He claims that an observer from the Cleveland Zoo was on hand. The young man with the zoo patches on his shirt was mentally challenged. 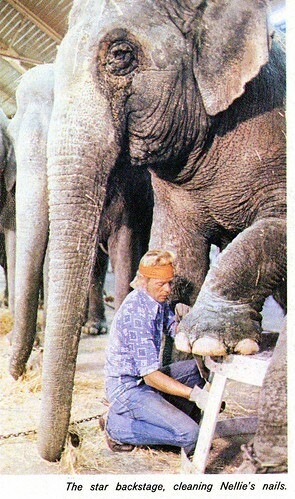 He was a fan of zoos and circuses and attended the show with his mother. 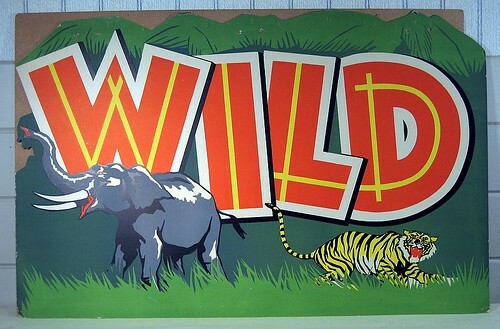 He wasn’t employed by the zoo, he bought the patches in their gift shop. He implies that I may have shoved him. It never happened. And for all of his claims of animal and human abuse, he shows nothing even remotely abusive. 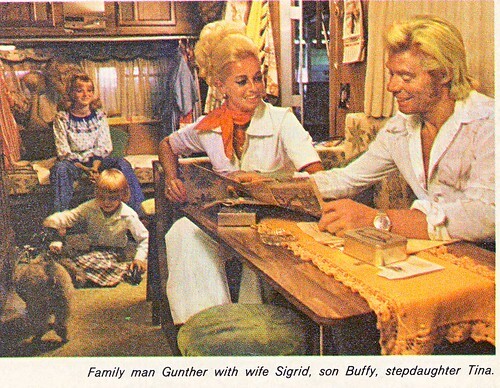 79809_thumb, originally uploaded by bucklesw1. 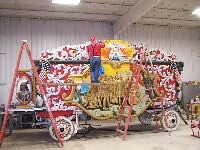 The Pawnee Bill circus wagon will be one of 52 elaborately-carved and colorful wagons that will go to Milwaukee for the Great Circus Parade next summer. 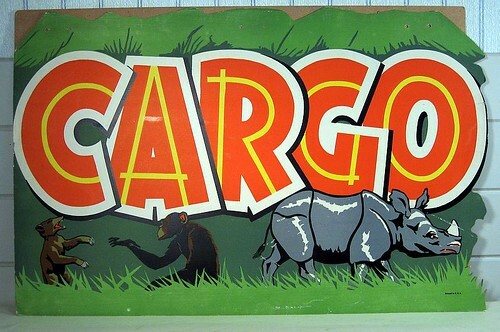 June floods cost Baraboo's Circus World Museum $89,000 in lost revenue from being closed a week, and many potential visitors were unaware the museum reopened quickly, the museum's board heard Tuesday. However, the message the museum is open has been getting out, attendance is rising and there is reason for optimism, CWM Director Steve Freese said. Circus World Museum Foundation Board members held their regular meeting and reviewed the museum's progress in the aftermath of flooding that shut down performances for five days and caused damage on the museum grounds. The foundation is a nonprofit body that runs the museum on behalf of the State Historical Society of Wisconsin, which owns the facilities. "We get about 50 calls a day from people still thinking we're closed because of the flood," CWM receptionist Deb McCarthy said. Comparing revenue through July 2007 and the same period this year, income from admission fees, the museum shop and other visitor purchases is down about $89,000, Freese said. Revenues to this point in 2007 were about $471,400, while it is at $382,300 this year. When the museum re-opened after flooding, attendance was down about 12 percent per day, said Gary Baker, CWM's accountant. And visitors have been spending less. "I think a fair amount of it is just the economy and the price of gas," he said. When the museum re-opened June 15, about 11,000 visitors had come through the door, Freese said, compared to more than 14,000 people up to that date in 2007. Freese said attendance seems to be headed in the right direction, with visitor numbers in four of the last six days substantially above the same days in 2007. Another sign of a positive direction is that Saturday attendance at the museum has risen substantially, Baker said. "Last year, I think the first thing people did when they came to the Dells was to go to a water park," he said. "This year, they're obviously doing something different because this year our (Saturday) attendance is maybe 40 or 50 percent higher." 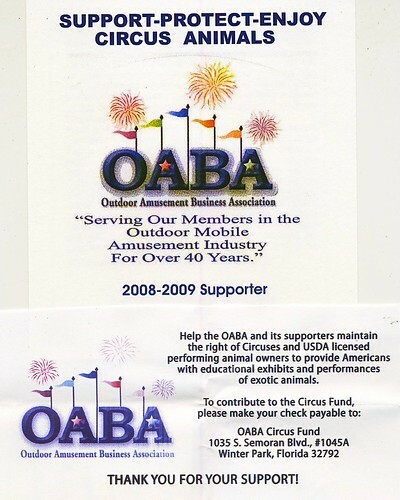 Baker reported the Circus of Chefs Gala produced $186,000 net revenue for CWM, about $40,000 above expectations, and that will help close the revenue gap. The museum also saved a substantial amount in expenditures and salaries while it was closed. "The difference (between income and expenditures) is really only about $20,000," he said. Board member Jonathan Lipp of Madison encouraged museum managers to keep a close eye on the financial situation. "There is a big gap in the fundraising that cannot be ignored," he said. Freese said the museum still has a month of the performance season left before it ends after Labor Day. That is enough time to attract more people and make up for losses. CWM will be working with local radio stations WOLX and Q106 to draw visitors, he said. 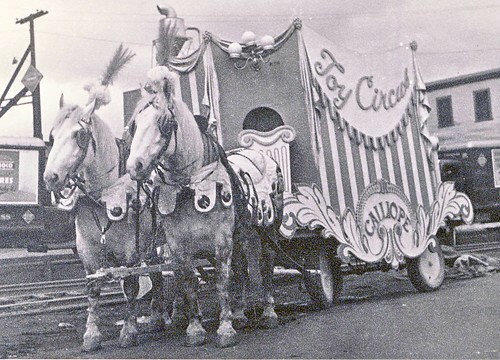 Board Chairwoman Renee Boldt said when the museum ends its performance season, staff will intensify their preparation for the next Great Circus Parade in Milwaukee, set for July 12. "When (singing Ringmaster Dave Saloutos) blows his whistle for the last time, it's parade time," she said. Freese said they have 52 wagons to prepare for the parade. 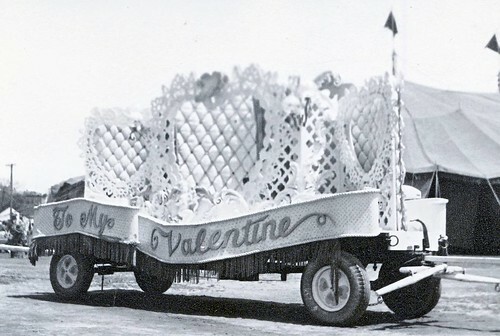 Right now, restoration staff are working on three of them, the Pawnee Bill wagon, the Elephant Tableau wagon and the Cole Bros. Air Calliope, because they need the most work to be ready for the parade. 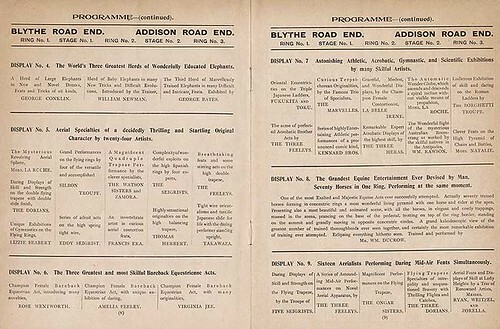 BB 1898 Front Cover, originally uploaded by bucklesw1. 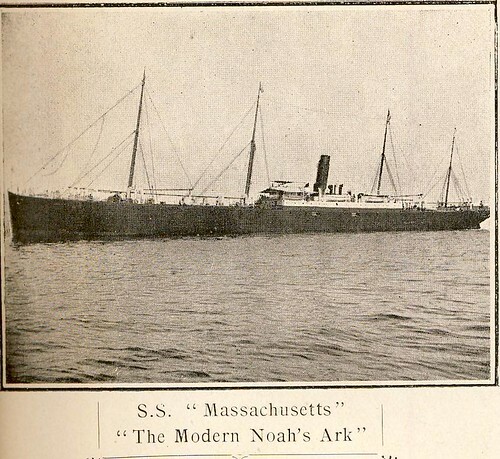 For those who might not have been around to remember it...after the season of 1897 ended in Philadelphia on October 9, James Bailey loaded the show on a ship and left for England where it went on a brief hiatus at Stoke-on-Trent. 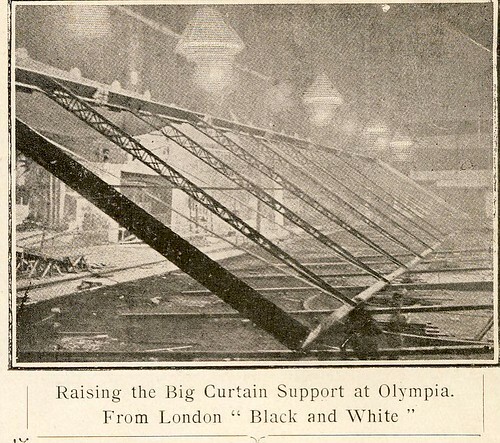 Less than three months later - on December 27, 1897 Great Britian was treated to its first look at "The Greatest Show on Earth" as the show opened indoors at London's Olympia arena. 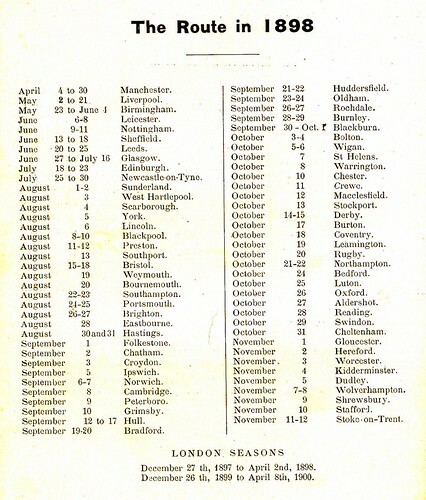 For almost the entire year of 1898 (Winter, Spring, Summer, Fall) the show played throughout England - with two dates booked in Scotland (Jun 27-July 16 in Glasgow, and July 18-23 in Edinburgh). 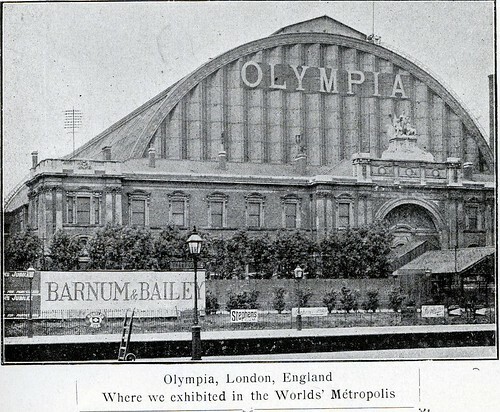 On November 12 1898 Barnum & Bailey briefly went into winter quarters for about six weeks, returning to the Olympia on "Boxing Day" - December 26, 1898 (see program). 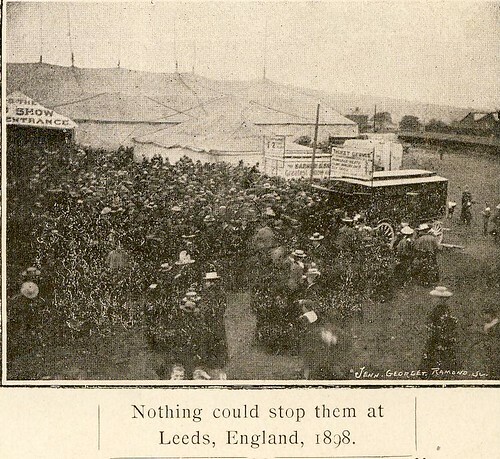 This show toured England until late summer of 1899 when it moved in to Scotland at Galashiels on August 29. 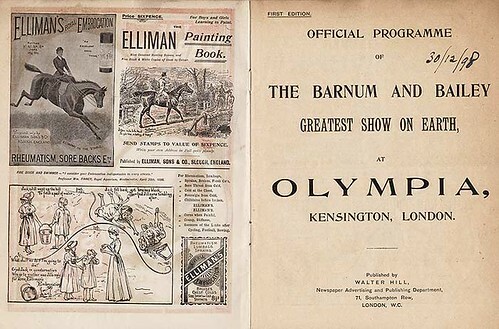 Throughout the month of September, and into early October, Barnum & Bailey had a string of one-nighters in Scotland along with a six-day stand in Edinburgh and five days in Glasgow. The show returned to England on October 7 and continued a route of mostly one-nighters until going into quarters at Stoke-on-Trent November 10. For the season of 1900 Barnum & Bailey found itself in Germany and Austria...opening in Hamburg on April 15...but that is another story! BB 1898 #1, originally uploaded by bucklesw1. BB 1898 #6, originally uploaded by bucklesw1. Scan10526, originally uploaded by bucklesw1. "______ on the high seas!" Scan10527, originally uploaded by bucklesw1. Scan10528, originally uploaded by bucklesw1. Scan10529, originally uploaded by bucklesw1. Scan10530, originally uploaded by bucklesw1. Scan10531, originally uploaded by bucklesw1. 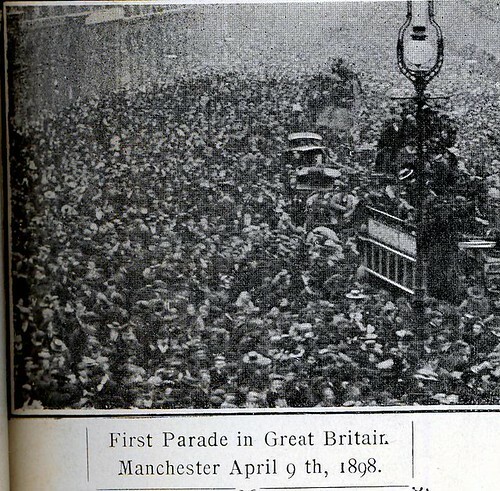 Have just spotted two clips of a Barnum & Bailey 1899 British parade on 'You Tube' plus 'Acephalemagic.blogspot' I can't easily transfer them to you as I use my local liibraries computer - perhaps you may be interested in them for your site? 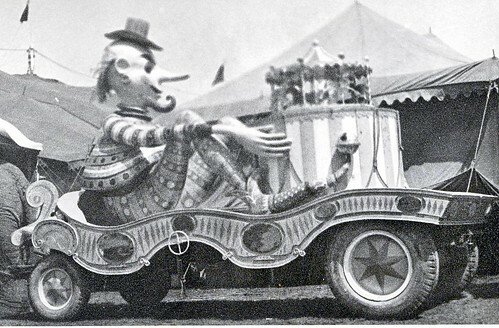 They are labelled Barnum & Bailey Parade (1899). Clips 1 & Clip 2 and show a reasonable amount of a UK parade from the shows 2nd year of touring here. They are from a "British Movietone News" film that was once thought lost though I'm not sure of town (I have details somewhere!). Clip 1 (just over 2 minutes) is best and, considering how old it is, quality is not bad. Clip 2 has a lovely shot of just how spectacular the 40-horse set looked, but after about 1½ minutes the film is really of the post parade crowd & vehicles following it to the lot, crowds wondering if more is to come, etc. The show made a great deal of fuss about camels being ridden by "Egyptian" musicians plus the elephants and howdahs - 1898 saw each camel pair being ridden and a rear-facing (? I believe) drummer, their uniforms all differed so were not particularly authentic. That year generally saw 2 howdahs with canopied tops & often reviews mentioning a neck rider plus Arab/exotics in howdahs. 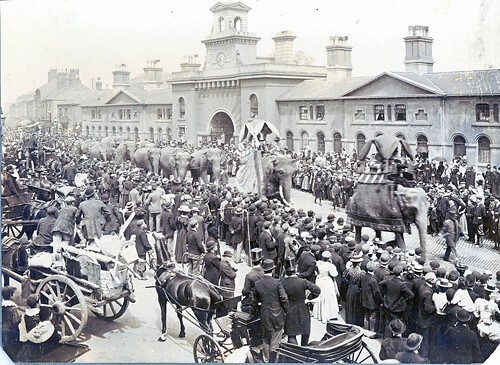 This 1899 parade shows very skittish camels not being ridden, though with 3 "Egyptian" garbed riders on the 2nd elephant. Alas, presumably of need to refill cameras, etc. the clips jump about the parade a bit. By the way, I loved the "Remarkable!" trapeze act video - worth watching each time I recheck your site - it was while hunting that on You Tube I fell over the B& B parade clips! 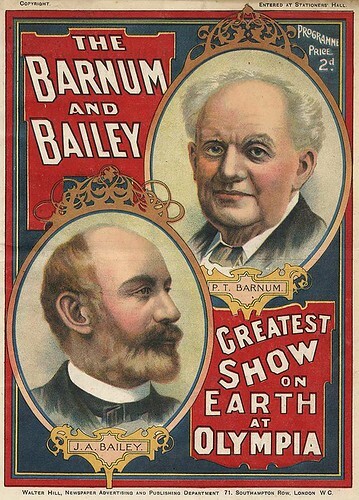 "On the back of the picture above my dad wrote BARNUM & BAILEY IN SCOTLAND. 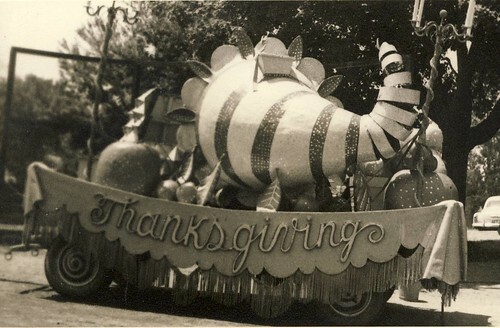 So it would coincide with Mr. Neill's parade clip." Scan10490, originally uploaded by bucklesw1. Scan10489, originally uploaded by bucklesw1. Gunther0001, originally uploaded by bucklesw1. All of today's stuff was saved by my mother. She sewed the pages together after cutting the article from the magazine, you may notice the tiny pin holes down the center of the page. Shannon managed to join these two pages together and even sharpen the image. 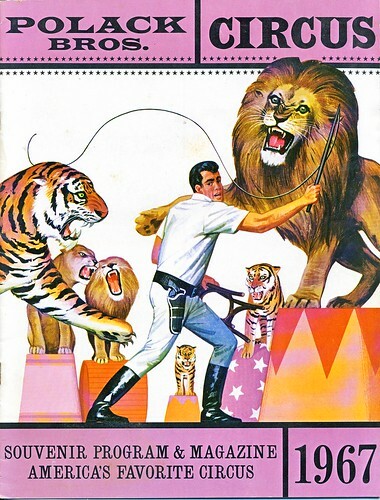 I would judge from the size of Mark Oliver that this was released in the mid 1970's. Jack Ryan and Jerry Digney probably know this Curry Kirkpatrick who once interviewed Barbara and me in New York. Scan10522, originally uploaded by bucklesw1. Scan10523, originally uploaded by bucklesw1. Scan10524, originally uploaded by bucklesw1. Scan10525, originally uploaded by bucklesw1. Do what you can to help! Scan10491, originally uploaded by bucklesw1. You never get too old to learn. 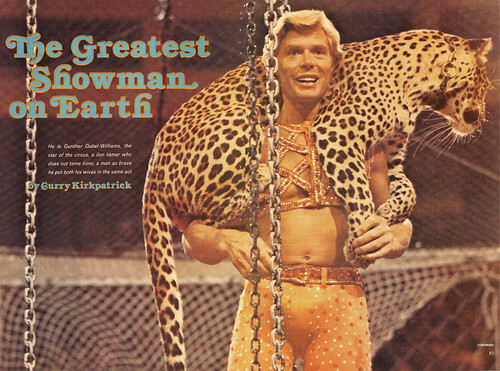 While putting together tomorrow's material about circus magazine publicity, I discovered that the real name for a well known personality on the Red Show is Helmut Schlinker. I'm curious of anyone out in Blog Land already knows who this is. !cid_X_MA2_1217095116@aol, originally uploaded by bucklesw1. !cid_X_MA1_1217095116@aol, originally uploaded by bucklesw1. Scan10519, originally uploaded by bucklesw1. Pat was a lot of fun to be around, never a dull moment. He had a nice home in Riverview not far from here, his wife was also named Pat and when you called and asked for Pat, she would always ask, "Which one?". 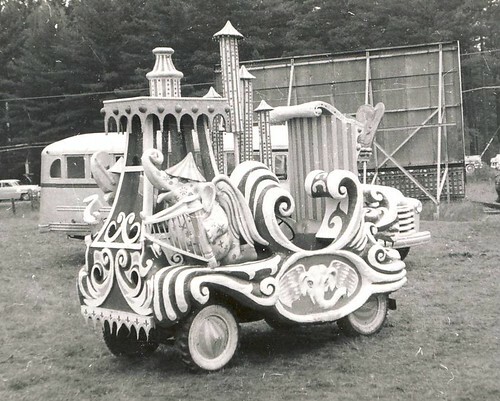 On the Polack Show he had a camper with a large tail gate that folded down into a veranda where he would place a couple of those movie set folding chairs and from time to time hold court. Louie Stern enjoyed walking and in the summer months would often walk from his hotel room to the building or fair grounds. He would then head for Pat's veranda, remove his coat and tie and bask in the sun, another of his pleasures. Pat would loudly discuss the events of the day while Louie dozed. One day I was passing by while Pat was elaborating on Manuel King when Louie awoke and said "What in the Hell are you talking about?" 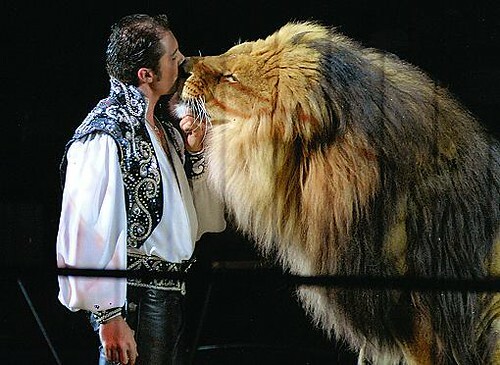 and Pat replied "This Jewish lion trainer!" 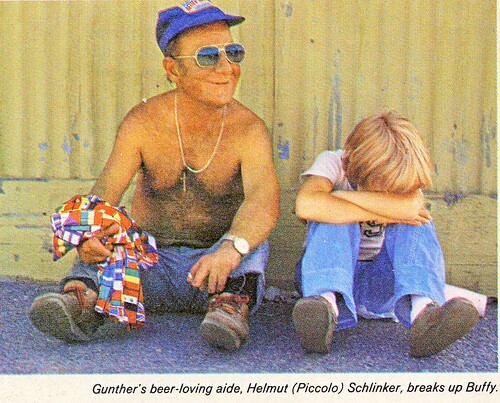 and Louie looked blankly for a moment and said, "Whatever you say Kid" and went back to sleep. Pat died of cancer so suddenly and silently that few people knew he was gone. I drive by the cemetery in Brandon regularly and often think of Pat and his daughter who had died so tragically before him. Scan10520, originally uploaded by bucklesw1. Parley Baer or "Polly Bear" as Louie called him, handled the publicity, the art work, the press photos and the bios as seen above. 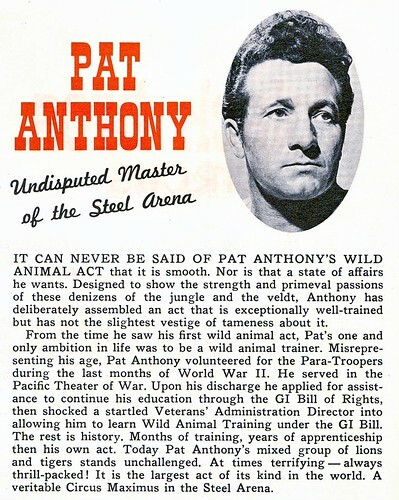 In private however, he referred to Pat as "The friendly, neighborhood wild man!". SAVE1411, originally uploaded by bucklesw1. Scan10521, originally uploaded by bucklesw1. 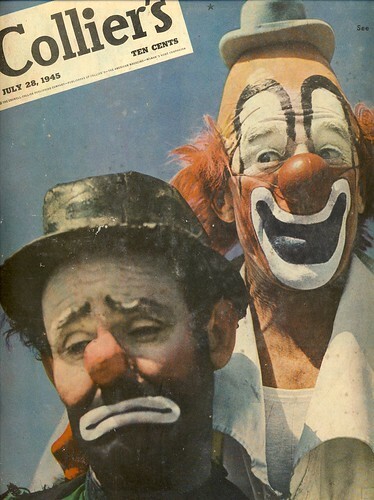 Circus Maximus was an indoor show bank-rolled by the owners of the Harlem Globetrotters and featured a lot of big name acts. So I was surprised to see that they lifted this photo from the Polack program as well as part of Parley's bio for their own use. MAIL0068, originally uploaded by bucklesw1. 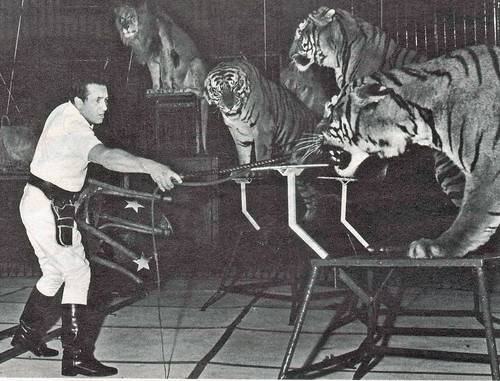 Pat was among several Korean War vets that studied lion training at 1,000 Oaks on the GI Bill. They all turned out well. Maybe Roger could elaborate on this. Week # 12 This is more like it! Scan10251, originally uploaded by bucklesw1. Scan10510, originally uploaded by bucklesw1. Dom, could you put a date on these pictures? I would like to file them by the correct year. Scan10512, originally uploaded by bucklesw1. Scan10513, originally uploaded by bucklesw1. Scan10515, originally uploaded by bucklesw1. Scan10514, originally uploaded by bucklesw1. Scan10518, originally uploaded by bucklesw1.